In what is largely becoming a smoke and mirrors world of monkey-see monkey-do and so called “revolutionary” vaporizers shaped like inhalers and whatnot coming down the pike at a constant flow, its always refreshing to encounter a product which smashes apart and reforms the very idea of an herbal vape. Especially for a true vaporizing vet like myself. Those German rascals Storz & Bickel are back at it again and have descended from high in the vapor clouds like ancient Gods to bring us yet another legendary herbal vaporizer. And we thought they just had a massive case of couch lock for the last 10 years! Such fools we are! In any case this new vaporizer while handheld, may not exactly be portable – but once you hit it you most likely will not even care. They named their new “vapenmonster” the Plenty and this my friends is not a misnomer by any means. Take it from me, I’ve got vapes comin’ out the wazoo. Once I got my Plenty I quickly realized that I had a new favorite to play with. Yea, it definitely has a different look and feel from most other vapes and took a bit of getting used to but let me tell you, once you settle in you will be a believer. I see people online looking for a stand for the Plenty but I honestly do not get it. The unit was DESIGNED to be laid down and it is absolutely safe to do so. Don’t ask me how this thing stretches my herb as far as it does. I pack it up once with .5 to .8g and it keeps going and going (I will save the Energizer pun) like no other vaporizer I have used. I find myself talking to it, like “Dude, I’m done. Enough already, just stop it!”. It can really almost be too much for one. In fact, most would probably agree that it surely is. As far as the thickness and volume of vapor it produces … Mama Mia! Insane. Vapor taste and quality? Magnifique! Being the weird vaporizer fanatic in my stone age neighborhood of dutchie and spliff smokers, this thing has got people rethinking their method of medicating. Trust me when I say I am just scratching the surface with this quick herb-inspired spiel. So do yourself a favor and peep out the review of the Plenty vaporizer for more dirt on this beast. If you are looking for a good deal, I got my Plenty vaporizer set on sale at NextDayVapes.com with free shipping. Got comments? Leave ’em below. The viVape from Vaporfection is the worlds first touch screen vaporizer. Vaporizers have never been so stylish. The ViVape Vaporizer from Vaporfection at first glance looks like a thick and a bit heavy iPhone. Although the price of the ViVape Vaporizer may come as a mild shocker for many yet a careful study of the features and the benefits can quickly change the overall outlook of the ViVape Vaporizer. Before venturing out to review the ViVape Vaporizer I was wondering if as a normal customer I would want to spend close to five hundred dollars for a Vaporizer from Vaporfection. I mean, clearly, they are not the market leaders nor are they the best in the industry. But I must say after checking out the ViVape that irrespective of their market share and despite Vaporfection not being among the heavyweights in the industry, they have done everything perfectly. ViVape is a product that goes on to show that if a company wants then it can outdo their earlier products and exceed expectations. The first thing I must highlight in my ViVape Vaporizer review is that it is extremely pretty. You may opt for the white model but black is more my color when it comes to appliances. The touch screen is super friendly and you do not have to struggle, temperature precision is fantastic and the ease at which it gets heated up and cools down is simply world class. One of the most pleasant experiences I had with the ViVape vaporizer is that it is absolutely quiet. I could not have made out it is working until I started feeling the effects. Now, beneath the glossy case there is some serious work done by Vaporfection. 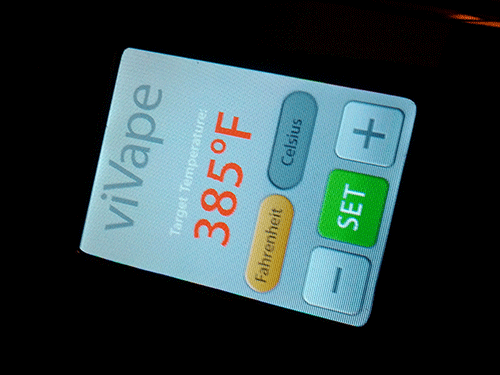 ViVape vaporizer runs on a digital microprocessor which is aided by a temperature sensor. The latter is responsible in detecting and operating the temp controls. A company’s small moves speak a lot about their intent. Vivape can be operated on a voltage range of 110 to 240. This surely speaks of the global plans of Vaporfection. With the voltage range you can actually use the Vivape anywhere in the world. I am not certain if people would like to carry this ultra modern state of the art vaporizer on holidays but if one wants to then it would be functional wherever one heads to. Before I started reviewing the product I was a little taken back by the price but after testing the Vivape vaporizer, it looks like a worthwhile investment.